Next part of C# 3.0 and LINQ Tutorial is alive. In it I cover anonymously-typed variables and Anonymous types. Again it is in Bulgarian. I hope bulgarian readers will like it. For those of you who are interesed in MS SQL 2005 Analysis Services (SSAS) there is very hot (February 2007) new guide that deep dives into SSAS architecture and discuss how to optimize memory, CPU and disk usage. To satisfy the performance needs of various OLAP designs and server environments, this white paper provides extensive guidance on how you can take advantage of the wide range of opportunities to optimize Analysis Services performance. Since Analysis Services performance tuning is a fairly broad subject, this white paper organizes performance tuning techniques into the following four segments. Enhancing Query Performance - Query performance directly impacts the quality of the end user experience. As such, it is the primary benchmark used to evaluate the success of an OLAP implementation. Analysis Services provides a variety of mechanisms to accelerate query performance, including aggregations, caching, and indexed data retrieval. In addition, you can improve query performance by optimizing the design of your dimension attributes, cubes, and MDX queries. Tuning Processing Performance - Processing is the operation that refreshes data in an Analysis Services database. The faster the processing performance, the sooner users can access refreshed data. Analysis Services provides a variety of mechanisms that you can use to influence processing performance, including efficient dimension design, effective aggregations, partitions, and an economical processing strategy (for example, incremental vs. full refresh vs. proactive caching). Optimizing Special Design Scenarios – Complex design scenarios require a distinct set of performance tuning techniques to ensure that they are applied successfully, especially if you combine a complex design with large data volumes. Examples of complex design components include special aggregate functions, parent-child hierarchies, complex dimension relationships, and “near real-time” data refreshes. Tuning Server Resources – Analysis Services operates within the constraints of available server resources. Understanding how Analysis Services uses memory, CPU, and disk resources can help you make effective server management decisions that optimize querying and processing performance. It is so fresh so it requires SQL Server 2005 SP2 in order to performance tuning techniques. I found great article explain how to implement Pluggable architecture in .NET. "Need to add/remove classes/components from your running system dynamically without any changes to the running code"
SQL Server 2005 Service Pack 2 has been released today. It is needed in order to run MS SQL Server smoothly on Vista machine. I run MS SQL 2005 Express/Standard on my Vista box but I had to turn off UAC (which is not recommended). I use Virtual PC and Remote Desktop Connection (RDC) a lot in my daily acitivities. Recently I found that there is very nice tool built-in Windows that allows you to manage miltiple RDC. You can start this MMC console by typing in Run command window (Win+R) tsmmc.msc. 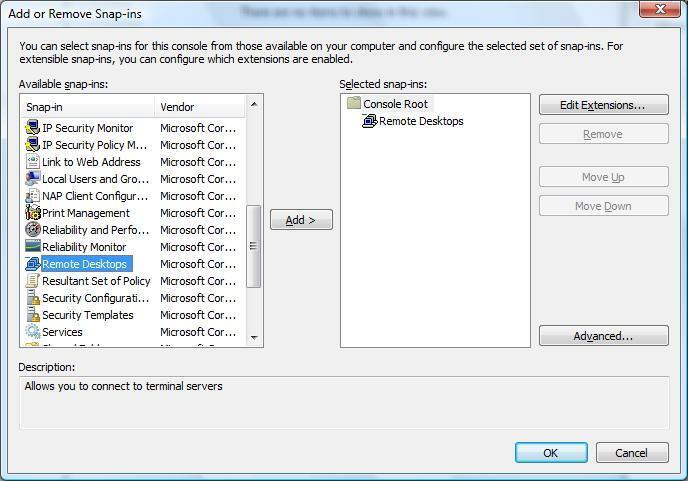 for more detailed way to display RDC MMC Snap-in see MS TechNet's Add the Remote Desktops snap-in article. So far so good. 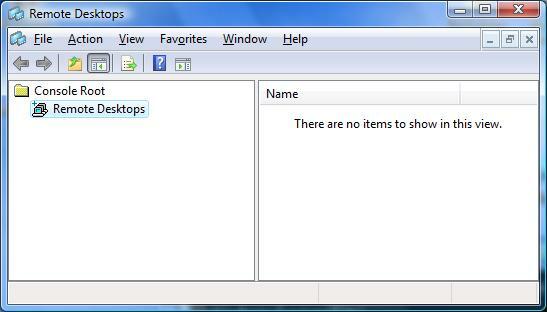 But I am running Windows Vista on my laptop so I need to use on it. But guess what?! I tried it in similar way as described in Add the Remote Desktops snap-in but I was not able to add this snap-in. There is no such file as tsmmc.msc.I found this thread in TechNet forums saying there are bunch of dlls in vista that need to be registered using regsvr32 in order to be used. Unfortunately even after registering these dlls I was not able to access RDC MMC snap-in. I as posted before I started tutorial about C# 3.0 and LINQ. I as able to write the next part - Object and Collection Initialization Expressions in C# 3.0. This one probably will be extended so stay tuned! Slovenia currency sign in Vista? Probably most of you know that Slovenia joined the Euro zone in the beginning of 2007 and official (and the only currency since about Jan 10th) became Euro. I am wondering where is Bulgaria on MS map as Sofia has been stated in GMT+1 time zone for very long time. I hope we are becoming more visible with each year. After speaking with my friend Marto I decided to write a tutorial about forthcoming features in new version of the very popular language C#. As always there is a lack of development materials in Bulgarian so it is written in Bulgarian and there is no language barieer for bulgarian developers who wants to take a look behind the corner to new version of our favorite C#. There is posibility to translate the whole tutorial in English (when it si finished) so this could be good starting point for all English speaking devs but this depends on the interest (and my availability). I have posted first two parts (of total 13 so far): Introduction and Acknowledgment with LINQ and basic capabilities. I hope I will be able to post next part very soon (projected within next two weeks) and I will announce it here. In the meantime I will be very grateful for your feedback. Any comments, reccomendations and request for more detailed reviews are welcome. You can post them as comments on the blog or to my emails stated on here.